It wasn't our originally planned destination. When Mom and I set out for a back roads trip heading 5 counties north of us a few days ago we were on our way to a plein air "paint out" event at Dudley Farms State Park in Newberry, FL. Only I just happened to have jotted down the name of a Florida Native Nursery that I thought per chance we might stop by on our way to the park. You know, just for a few minutes. IF it wasn't too far off the main track. IF we had time. The nursery doesn't have a website... only a phone number. 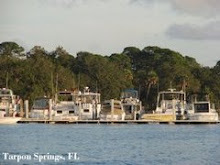 When I made the call to the owner we were approaching the little town of Dunellon, FL where it was located. The very nice owner of the nursery gave me clear directions and let me know it was only about 8 miles off the main road. Turns out we hung around the nursery for over 3 hours and there wasn't time to get to Dudley Farms by the time we were finished gabbing and shopping there. No problem. 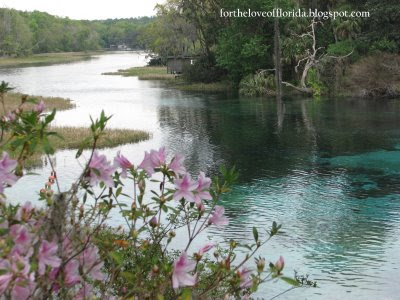 Rainbow Springs State Park is right up the road another 10 or so miles. 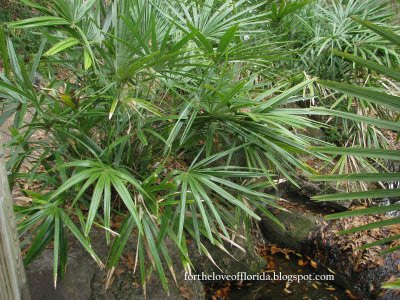 They have some native plants growing there I wanted to see anyway. I haven't been to Rainbow Springs since I was a kid. That's been a long time. I forgot it was there. You've been looking at photos of the entrance drive. Views of the banks of flowers before one ever gets to the parking lot. It cost a big fat $1 to get into the park. This must be the absolute best time to see the park. It was full of blooms. Every flowering tree and bush was loaded with flowers. When I got home and looked through the photos it jogged a faded memory... then I looked it up... 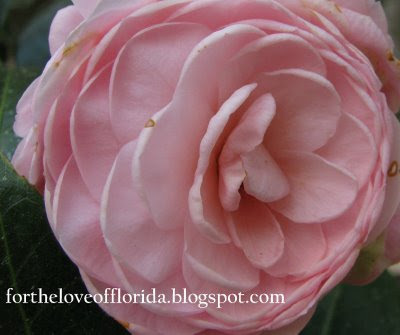 The meaning of Florida is flowers and the word comes from the Spanish Pascua, meaning “feast of flowers or Flowering Easter”. So this flower is why I wanted to go there (as a second choice to Dudley). 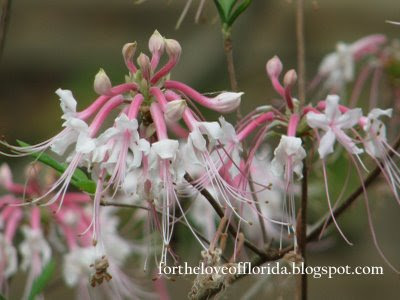 The native azalea, Pinxter Rhododendron canescens was growing there and the little lady at the nursery had told us we would find it at the springs. Want to see it up closer? And how about this close? I.Want.This. Plant. In my yard. They like a fair amount of water. It was growing near a stream in the park. The center attraction of the park is the swimming and picnic area with its focal point being the crystal clear, blue waters only found in natural springs. 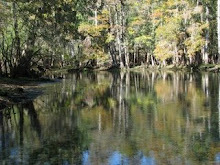 These springs form the Rainbow River, which flows about 6 miles into the Withlacoochee River in Dunnellon and then to the Gulf of Mexico. More on the history of the attraction can be found here. We didn't swim but we ate a packed picnic lunch on a hill overlooking the swimming area. No, the little lady with the hat isn't me or mom. I just like to take photos of strangers unbeknownst to them. Wouldn't it be funny if you saw yourself on a blog you just happened to stumbled upon. No? I didn't think so. I wouldn't be too keen on it either. 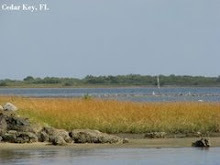 There isn't a lot to "do" if you don't canoe, kayak, swim, snorkel, fish, or camp. Ha! 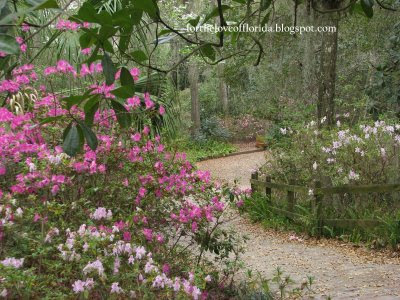 The pathways through the gardens were overflowing with flowers and plant life. It was awe- inspiring. 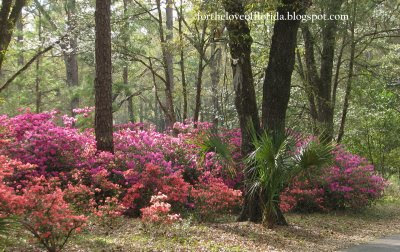 The azalea shrubs towering 8-12 feet in massive amounts of pink, lavender, white and corals were really a sight to ponder. Refreshing sounds of waterfalls throughout the gardens flowed down the huge rocks that were moved from the river to make the falls. 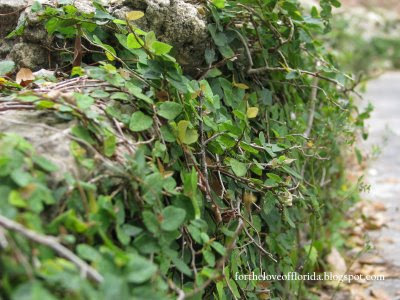 Creeping fig mingled with the stone walls. Not sure what this flower is... it was a flowering tree loaded with white. Anybody? 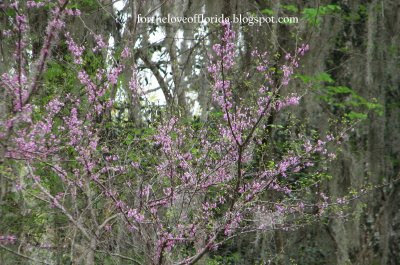 Is this an Eastern Redbud? ... and this one? I am seeing this one along the roadside every where. 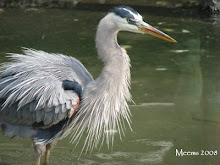 But I love to photograph them. Not just here but everywhere I go. 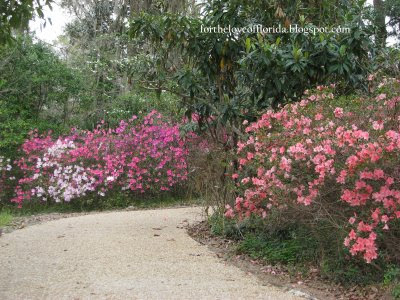 So I went here purposely to see the native pinxter azaleas blooming. That was a treat. I've never seen them for sale here. Way back at the end of the scenic walking trail if you walked all the way around the butterfly garden that had been practically leveled due to hard freezes... was the most fragrant and delicately blossoming tree in the whole park. 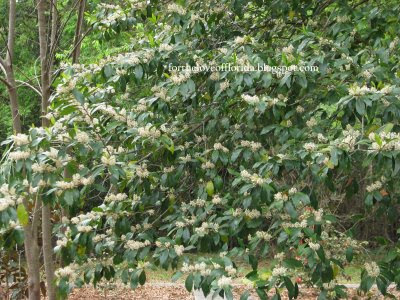 The stake resting at its feet identified it as a "Southern Crabapple." 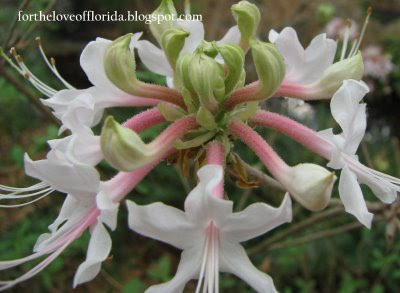 Can you smell its sweet ,wafting fragrance as delicate and subtle as the flowers appear. Update: found the botanical name in my new Florida's Best Native Plants book. 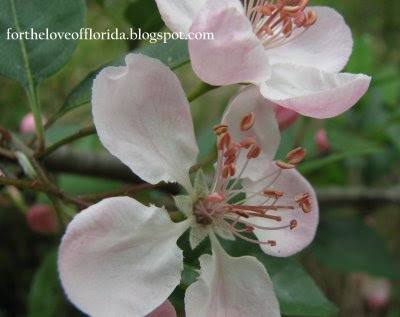 It is Southern Crabapple; Malus angustifolia. All that blooming and excitement caught us quite by welcomed surprise! We're going to have to get to that "paint out" next year for sure! No plant nurseries along the way! You are right .... just beautiful! 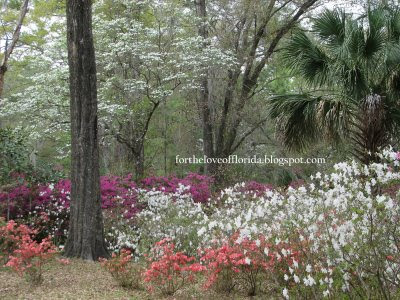 My wife and I were talking about all the azaleas and dogwoods in our neighborhood in Tallahassee today .... just gorgeous!!! As always the pictures are breath-taking. Looking forward to our spring here. this looks like another perfect florida day. i love love love the close ups. were you able to buy any plants, seeing you were at a nursery? 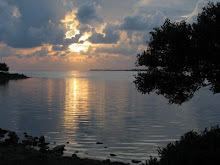 sounds like you and mom had a wonderful time although i would love to have made it to the plein air painting too. today is our 6th straight day of overcast ugly no sunshine weather. yesterday i was looking at beach cottages to maybe stay in sometime in the near future. Well? Did you buy any plants? Stunning photos.Rainbow Springs is my husbands favorite park,btw. Can't tell you how happy I am to see you have enjoyed our neck of the woods. 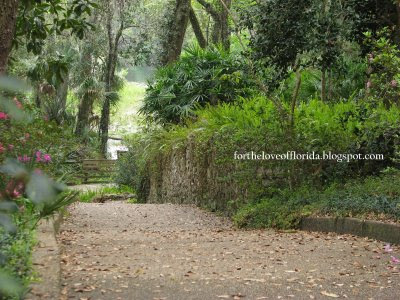 Rainbow Springs is just as you have described, only wish more folks would enjoy it. So sorry ya'll didn't get to Dudley Farms for the Paint Out. SPECTACULAR!!!!!!!!!!!!!! You and your Mom would have loved it. Please come back up this way and make a point of seeing Dudley Farms. The Paint Out just enhanced the already 1800's original Farmstead. Sitting on the front porch chatting with your girlfriend (Mom) is one of the most special memories ever. http://www.friendsofdudleyfarm.org/ This is on the State's list of State Park closures. Let us know when you come this way again! Enjoyed reading. :-) I guess I don't live far away. 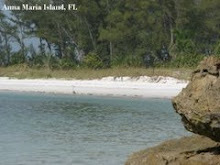 I live on Sanibel Island. This looks like such a beautiful place. I would love to go there sometime. I'll be up your way to visit my son in Tallahassee in a few weeks. I'm hoping the dogwoods are still blooming. Thanks for stopping by. Your vacation is getting closer and closer. You are going to love the warmth! The weather has been great. Cool in the mornings and warm during the day. A little too warm for me but I'm not complaining...yet. Oh, I was in anguish over missing that paint out. But you know, it was totally my fault. Yes, I found plants and wonderful things at the nursery. Trying to get a post up at Hoe and Shovel to document. The little lady that owned it was delightful and full of all kinds of information. Beach Cottages? Hmmmmm... that sounds good any time of year! 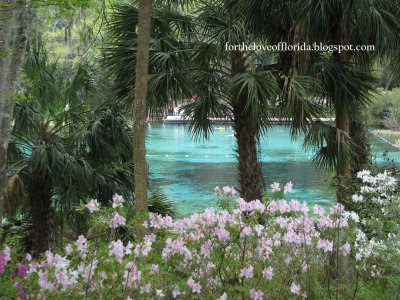 Honestly, I had forgotten Rainbow Springs exists. Sad, but it is the truth. I am SO glad we got to see it in full bloom -- quite by chance. Yes, I bought plants. It is my weakest trait. Go to nursery. Buy plants. I'm just wired that way. 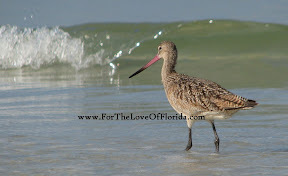 There is so much to do right in our own backyard of the beautiful state of Florida. We could go somewhere every weekend and not exhaust the resources. As sad as I am about not making it to Dudley for the paint out I will try to get back there soon. Maybe for the seed planting in April. 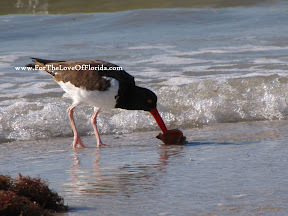 I LOVE Sanibel Island... especially Captiva! What a dream life! No, you aren't too far. 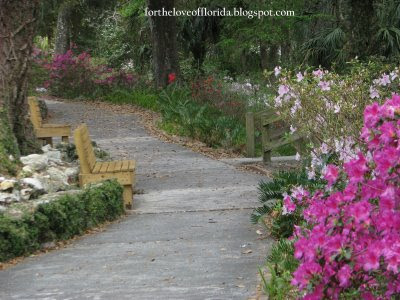 Rainbow Springs is north of me- it is worth the visit now while it is blooming. 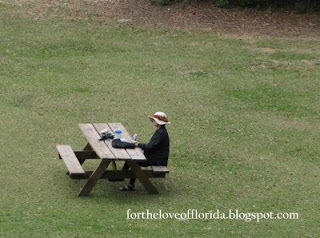 Thanks for coming over to For The Love of Florida. Hey- thanks for popping over here. 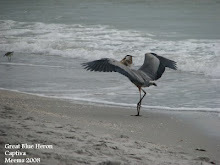 I'm having lots of fun with this blog about my great state of Florida. My neighbor has the pinxter... I walked over to have a look at hers today. Only one plant left out a few she started with but it is gorgeous and blooming. If I can find one - I WILL have it or two or three. Those word verification are too funny sometimes. So beautiful! 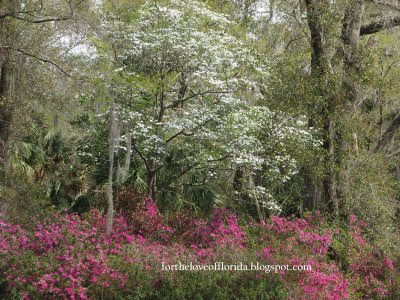 We have been on vacation this week (in G'ville this morning and will be home tomorrow) and loved seeing the beautiful flowering trees in north Florida, Georgia and Tennessee, but I am so ready to be back at our home on Pollywog Creek. We just can't get the sand out of our shoes. Meems -- What a wonderful "tour" with photos. It's so nice that you enjoyed the day with your mother, too. Oh, it's so beautiful it feels like being in a dream. 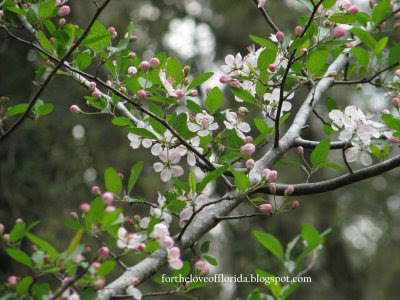 Love the dogwoods & crabapple in bloom. Makes me want to book a flight and visit there. 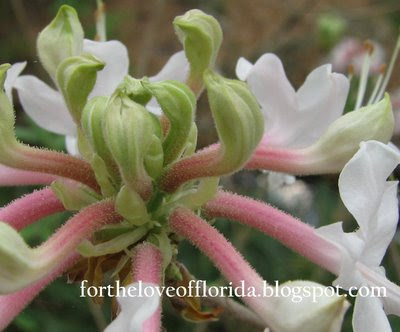 "Not sure what this flower is... it was a flowering tree loaded with white. Anybody?" It's a wild blackberry bush! They taste great but watch out for the thorns! They can get pretty tall if they have to fight there way out among other plant to get sunlight! Enjoy the berries and thanks for sharing your photos! 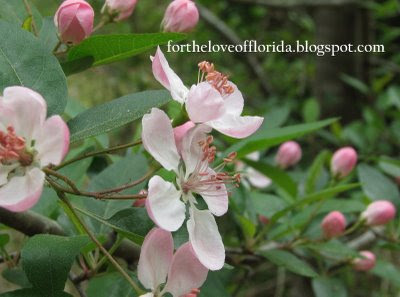 Driving along Longboat Key today we saw some beautiful flowering trees with long pointed red spiked blooms. They were on right side going south in about the middle of the key. Can anyone identify this tree? We've never seen one quite like this before. I'm not sure what kind of tree you saw but your description along with my love for LBK makes me want to get in the car and take a drive there this minute to see it. If you find out what it is... be sure to update... Thanks. (Schefflera has gorgeous red spikey blooms). 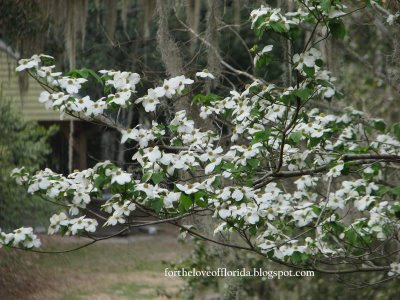 and here I was looking for info concerning when do the dogwoods bloom in Tallahassee. Lo and behold I find you informing everyone of my absolute favorite destination! Thanks so much for the photos and blog. 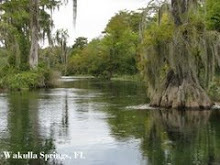 Last September 2011, we camped in Rainbow Springs and fell in love with it. Being a south Florida native, I was unaware of the beauty to behold. 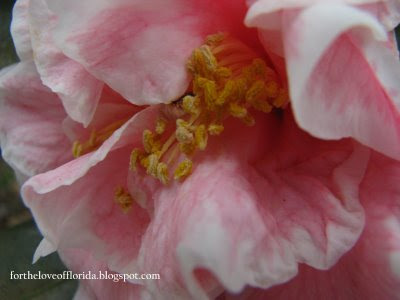 I made a vow to come back in spring when all the flowers and flowering trees were blooming. Your blog has me primed!